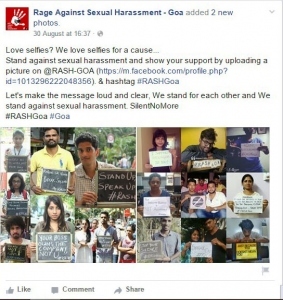 Goa News |FB page by media students against sexual harassment goes viral... Join! FB page by media students against sexual harassment goes viral... Join! 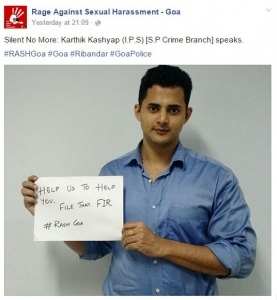 RASH, a movement against sexual harassment at workplace, started by Goa’s journalism students, is going viral on a Facebook Page. The specialty of the Page is just not to Like it, but spread a message with a ‘Selfie with Poster’. RASH means Rage Against Sexual Harassment. And the message you have to give through poster is anything related the topic, like the ones you see in the photos attached here. 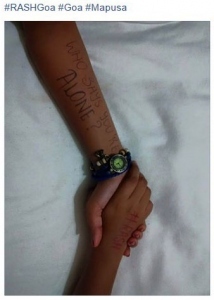 Started on 26 August, it has nearly 1600 Likes till now, and it’s rising day by day. Do you want to know more, well, simply click on RASH FB PAGE here, Like it, have a look and prepare your own slogan. Take a Selfie and simply post it. Many have done it, including Goa’s young and tough Superintendent of Police Kartik Kashyap. 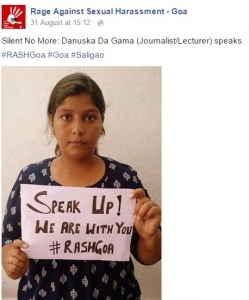 Danuska da Gama, a journalist girl, who also teaches journalism. There are many more, including social activists, writers, artists, lecturers, housewives, parents and even small children. The page is in response of the initiative taken by Goa Union of Journalists last week, by forming a Cell and approaching managements with a request to form committees, as per the law, to arrest any attempt of sexual harassment. With Tehelka-fame Tarun Tejpal’s case happening in Goa and several skeletons tumbling out, the media organisations are now coming under scanner. Talks are also making rounds with similar cases happening in Goa. Thus the initiative by the students, who are tomorrow’s journalists, to make their future secure. It’s just a click away and even you can join the movement.